So I am going to make a free game set in a crime-filled city. For it, I am in need of sprites and facesets for each character. Gangster: Every gangster doesn't look the same, so if you want to provide multiple ones, just add some slight alteration to their sprite. Blood on their coat, facial hair, etc. And I mean a gangster that looks something like this: https://images3.alphacoders.com/247/247125.jpg Police: The cops are not as important. I just need one character (face graphic and sprites) for each of the following: Police Officer, Soldier, and S.W.A.T. team. It would also be great if they looked like they were from the time period of the gangsters in the image above. Civilians/Generic-Looking People: I'll need a few different people for towns and such. A bit of variety, but not too much will be great. I'll need about 10-15 different civilians or any common person. EDIT: I would also like the sprites to be 32x64 each. That is, 2 standard tiles tall and 1 tile wide. Madurai posted a topic in Archived Games -Projects that have been inactive for 12 months are stored here. Mr. Detective posted a topic in Archived Games -Projects that have been inactive for 12 months are stored here. Hello. I just finished my first full map for my game and am really excited to share it and get some feedback! As you'll see, I used Celianna's Futuristic Tile Tiles Resource Pack (DLC off Steam) as the base tileset. 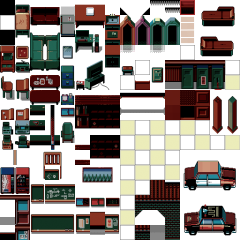 I highly recommend it, as it provides a lot of variety in one tileset. The map was meant to feel large while still limiting the amount of redundancy in decorations. Near the end, I started to notice a little lag, so I had to delete a couple of unnecessary decorative events. I'm hoping that the addition of my NPC events won't gum up the map too much. I also wanted the map to feel like it made logical sense from a practical engineering standpoint (for example, the main water treatment room is adjacent to the showers, garden, and kitchen; the medic bay is down the hall from the gym). The centerpiece of the map is a giant VR training sim (think X-Men's danger room) that plays a central role in the story, with the first chapter taking place in it. I'm not entirely satisfied with the shading. I ended up trying to follow the default shading rules (entire map shaded from a light source to the left) because I liked the visual effect shading had in a couple of places, but I wanted to be consistent. I toyed around with the idea of removing shading entirely, since this was an interior map afterall. I also considered doing custom shading for each room, assuming each room would be lit by a central lighting source, or doing something else, but I didn't feel comfortable enough doing this. I used a couple of character graphics for my map that other people made- Hira's arcade machines, Avadan's mech, Rico's bathroom signs, and r0knes's weight bench and dumbells (pending permission to use them, of course). I also added the large trees and a couple bushes from the Modern resource pack. My own original creations include the punching bag, dart board, chess game, basketball court, and modified tiles to make the track circular. I plan on making and importing a paralax background for this map that's mostly a twisting mess of pipes, gears, and steam valves. This should be visible in the gaps throughout the map. This next screenshot is from the left side of the ship. In a later chapter, the ship sustains damage which results in the VR generated world to "bleed out" of the bay and into the ship itself, and the party must navigate through the ship and shut off the VR core (click this link for more information on the proposed story: http://www.rpgmakervxace.net/topic/21915-plot-outline-for-a-sci-fimodern-rpg-using-a-plot-twist/ ). I saved the greenish tiles from the tile pack to use in this map and hope that it has a nice alternate/perverted reality feel. Hello I'm very new to RPG Maker, and while I have dabbled somewhat in pixel art here and there I am far from good at it, and the general idea of making things so small xD but I love this program, and I'm determined to learn!! I have a resource section, you can find it here: http://www.rpgmakervxace.net/topic/17409-neverwards-workshop-recent-add-roads-and-potholes/ However it appears that people have very little to say, and I'm seriously in need of some feedback to know if my tiles can be improved in any way, or if there may be some better way to design them, or really just anyones opinions on them! Here are a few that I'd like feedback on the most: My willow trees. I was very uncertain about making trees, most my attempts didn't work out so hot, but this I feel like came out ok. There are four colors. RTP Grass, my dream ice color, and then on the other one RTP Swamp willow and RTP Ice. I'm unsure about the coloring, and I know the second one is very vibrant but it's for a psychedelic scene. I also wanted to see what people thought of my road tiles and potholes. I feel like I might be missing some easy way to make road autotiles xD however this is the only format I've found to make nice cohesive roads. The potholes were fun, I feel like those came out pretty ok. The last thing is my futuristic building tile, it was the first building I'v ever tried to make. I want to know what you guys think of the texturing and shading! I guess that I'm pretty much positive I need more practice on sprites so I won't be asking for critique, and my facesets and portraits are welcome for comment and critique though I'm not asking for it I really appreciate you guys reading this, and any feedback I get! <3 I'm learning and plan to get good enough to help others and give resources that are useful and perhaps even sell my art. I really appreciate the RPGM community! Have a bit of an idea for a system in a game setting I thought up. First it would be modern setting, with real world guns. I'd like to establish that first so hopefully I can get some points across. Rather than having infinite bullets, I was trying to think up a way to kinda nerf that. Make players pay for bullets? That would be a very fast way to put people off from an RPG, Horror survival maybe but not what I was going for. Finally I came up with a decent idea. TP = Bullets. To explain further; -Each type of gun(pistol, rifle, shotgun, etc) would take a certain amount of Bullets to fire. This would replace the standard attack opinion. -Using items, skills, or other actions; players could refill the Bullet gauge to keep attacking. For example, Defending could be "Reload" giving a small defense buff and refilling the gauge. Ammo Clips could refill the gauge for the whole team. -This way players would have to worry about how many shots they have, but still not have to worry about the endless supply of reloads they have. However, not sure if people would enjoy a system like this given that a lot of games don't make you worry about ammo for the gun. So I was wondering if this sounds like an interesting/cool/fun idea, and how other people handle guns in their games. http://www.projectbc.net/vacantsky http://rpgmaker.net/games/1046/ Death is the least of Auria Edith's concerns. After being unceremoniously murdered on a weekend trip, she has found herself thrust into the heart of a mystery involving an eclectic organization of masked people known as the Virad. Who are they and what is their connection to her murder? Vacant Sky is the first game created by studio Project BC and was made in RMXP. Development began in late 2006 during the days of RMXP.net and continues to the present day. It's a deconstruction of the classic JRPG story and follows the psychological journey of Auria as she's forced into the role of protagonist, having no choice but to fight through everyone who stands in her way. It explores the damaging effect that being a "hero" has on one's state of mind and how they try to cope with it. Features: -Original soundtrack composed by Tarranon, featuring vocal tracks by Melody Yoo and Melanie Ehrlich -8 playable characters (along with up to 6 guests) -Customize Auria's stats and growth -Select your own progression of techniques -Interact with your party members to strengthen your relationship with them -Unlock guest art title screens through sidequests -"Reaction" system to determine whether you parry, block, or counter attacks -Six endings gained over the course of a New Game + -Your choices radically affect the course of the story and the lives of others Download: Acquire the Act I+ public beta here: http://rpgmaker.net/...downloads/3034/ Please feel free to post your comments and thoughts! Music: Check out the OST here: http://vacantsky.bandcamp.com If you like the music, support the composer by buying the soundtrack!